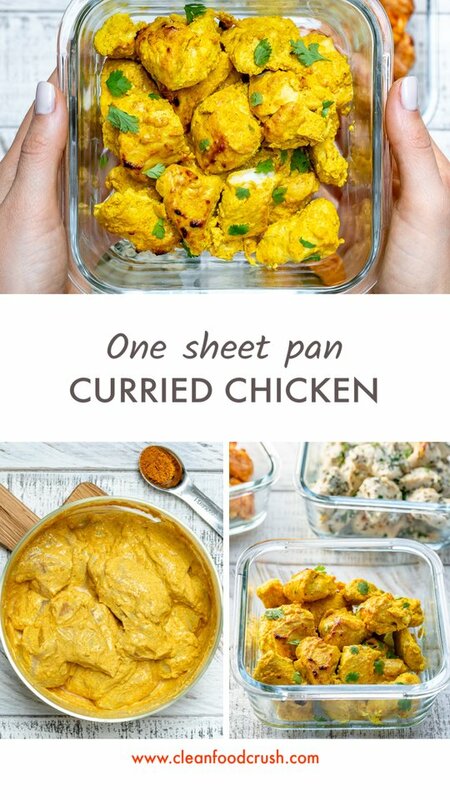 One Sheet Pan Meal Prep Chicken 4 AWESOME Ways! Have you ever heard of batching? Batching is: doing a bunch of similar tasks all at once! 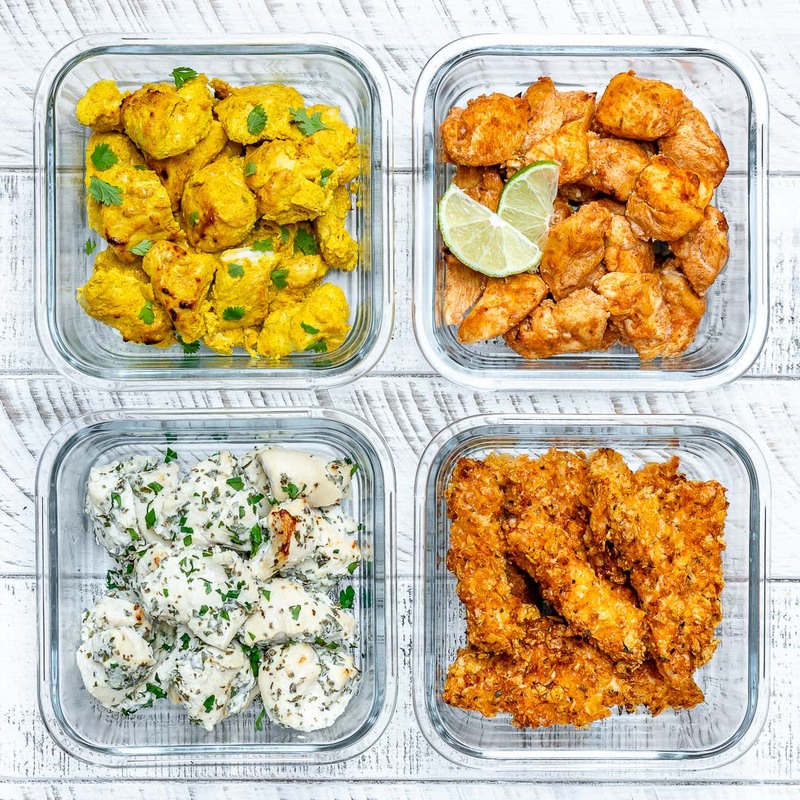 Food Prep Simplified! 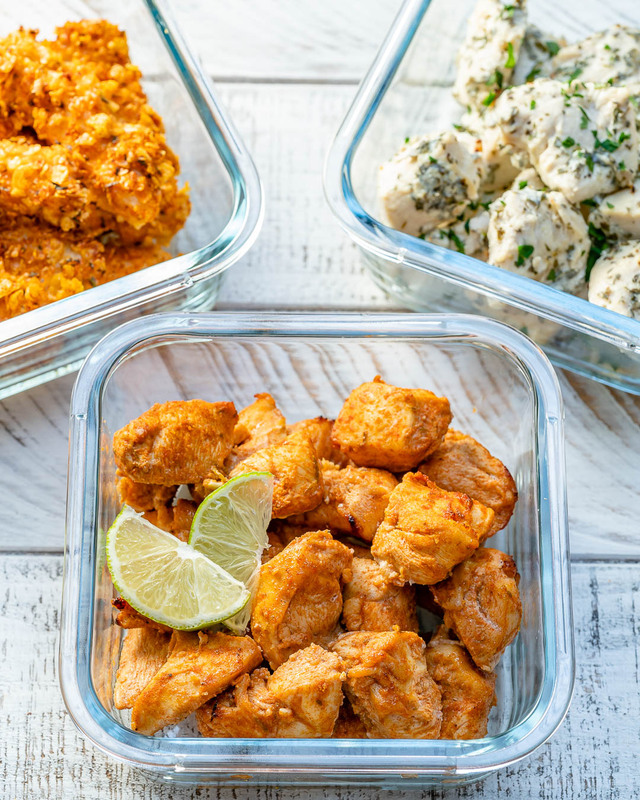 Make 4 different flavors of chicken for your #mealprep , salads, tacos, soups, gyros, whatever…in under 30 minutes of actual hands-on prep time! 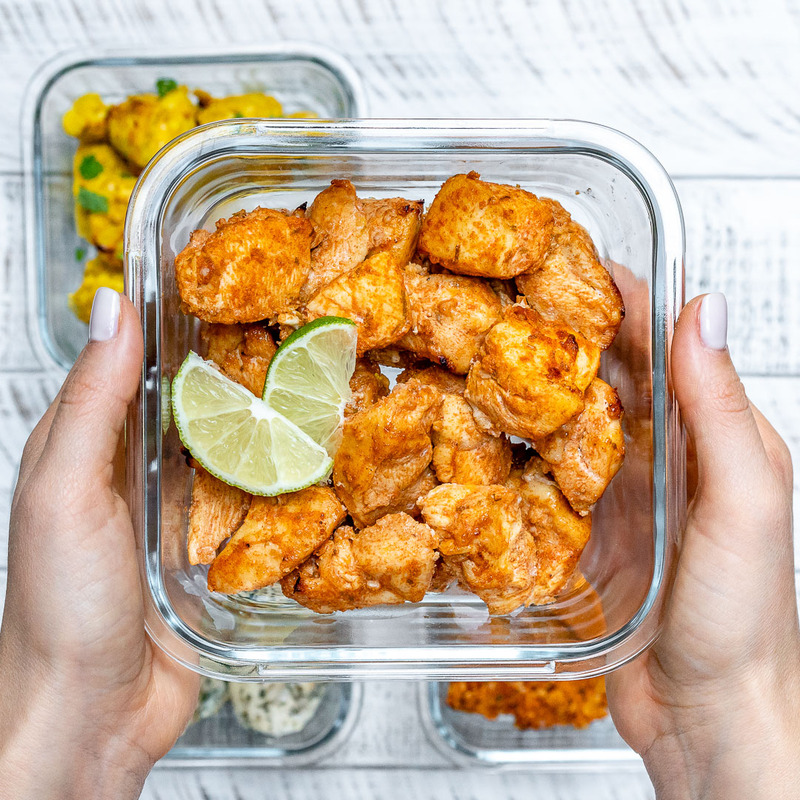 Add all the ingredients to a mixing bowl, or large Ziploc and gently toss to coat well. 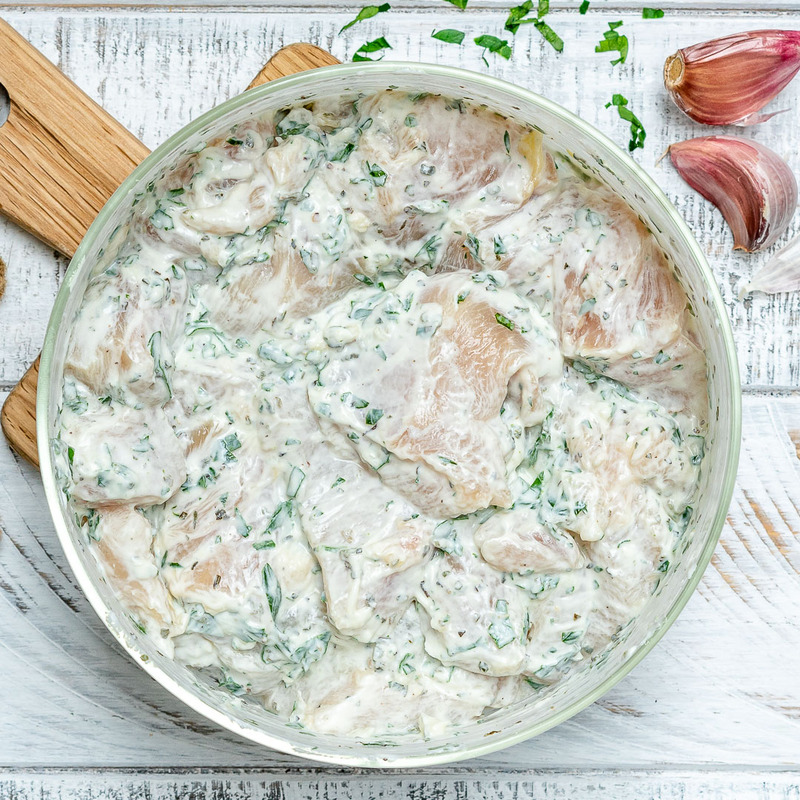 Cover and marinate in the refrigerator for at least 1 hour or overnight. In a medium glass bowl, add egg, sea salt, and pepper, and whisk until well-combined. 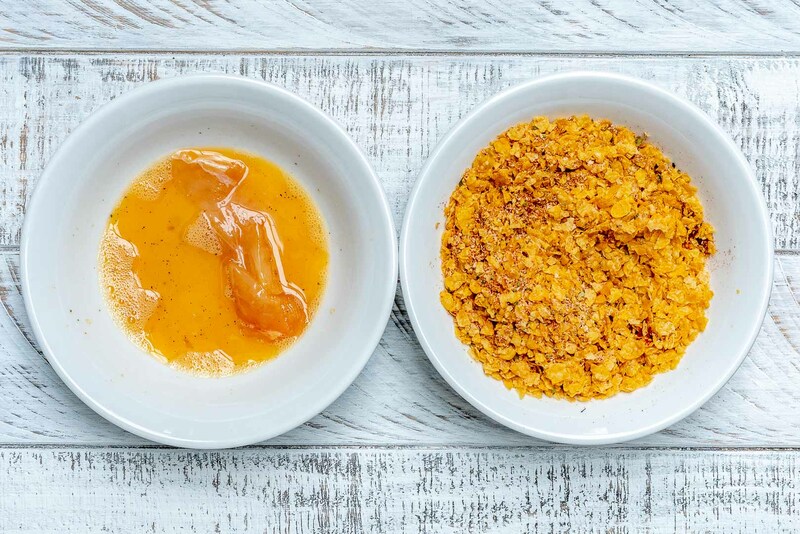 In another bowl, stir together crushed corn flakes, parmesan, paprika, oregano, and garlic powder. 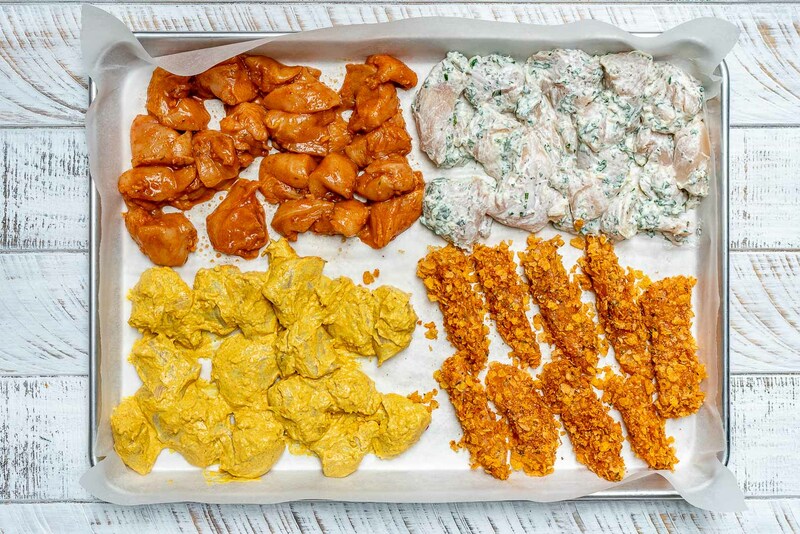 Coat each chicken piece first in the egg wash, then into the cornflakes mixture, making sure you get it well coated on all sides. 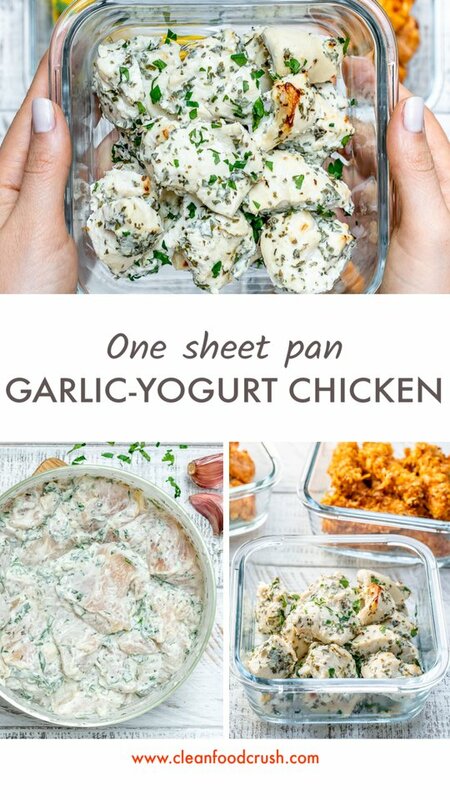 Shake off the excess and place onto one corner of the prepared baking sheet in a single layer. 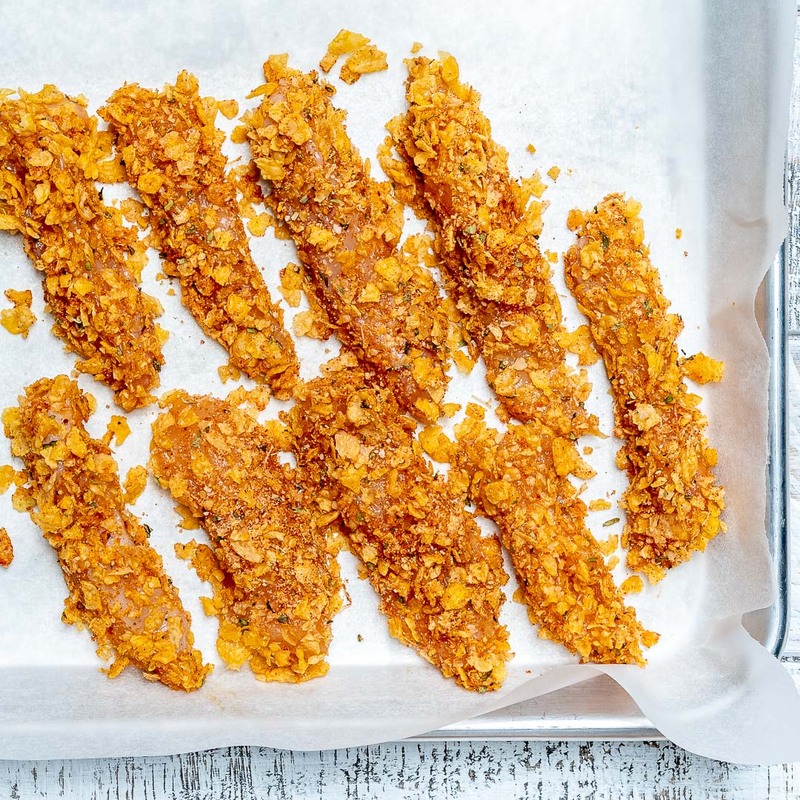 Lightly spray the tops of the cornflake coated chicken pieces with cooking oil spray. 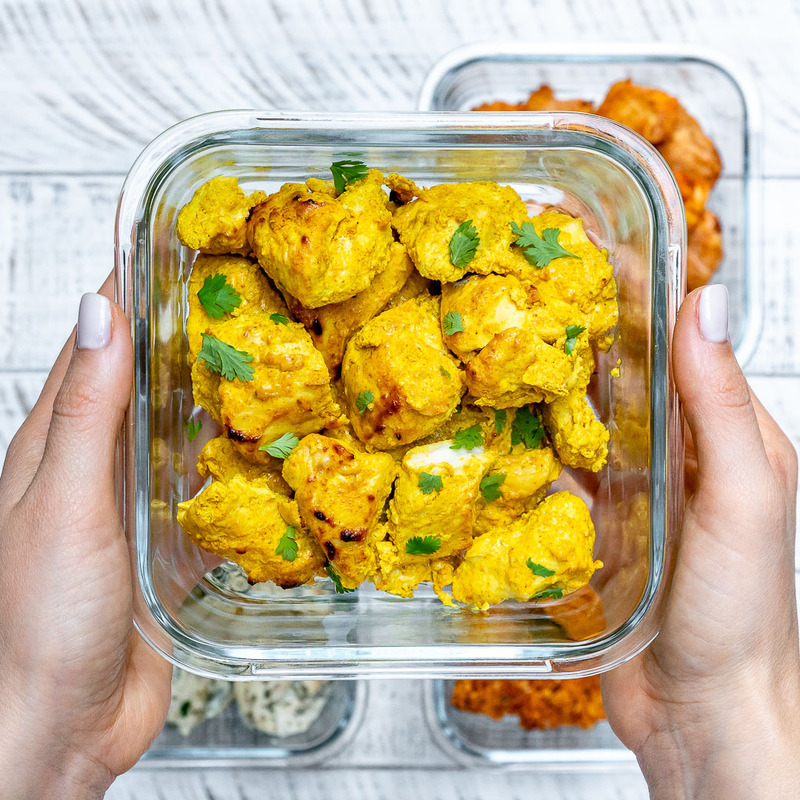 Place the Curried Chicken, in a single layer, on one corner of the tray, then the Chili-Lime Chicken, and Garlic yogurt Chicken on the remaining corners of the tray, not toughing one another, as they need space to cook properly. 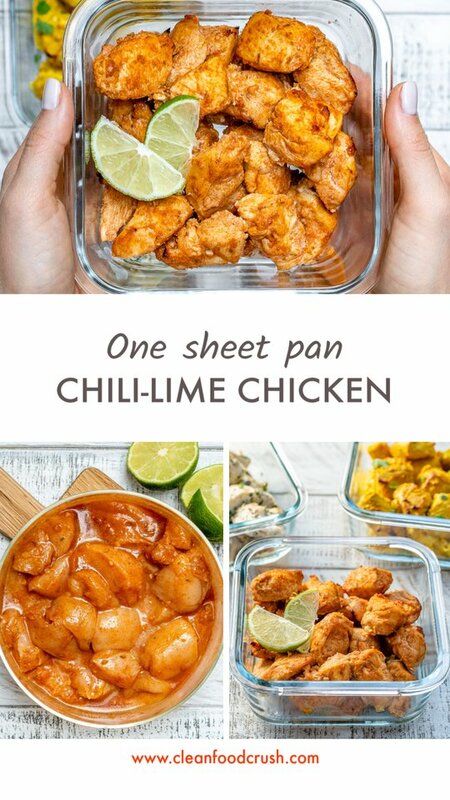 Alternatively, you can use 4 smaller pans for each type of chicken. Roast until all the chicken is cooked through, 15 to 18 minutes. 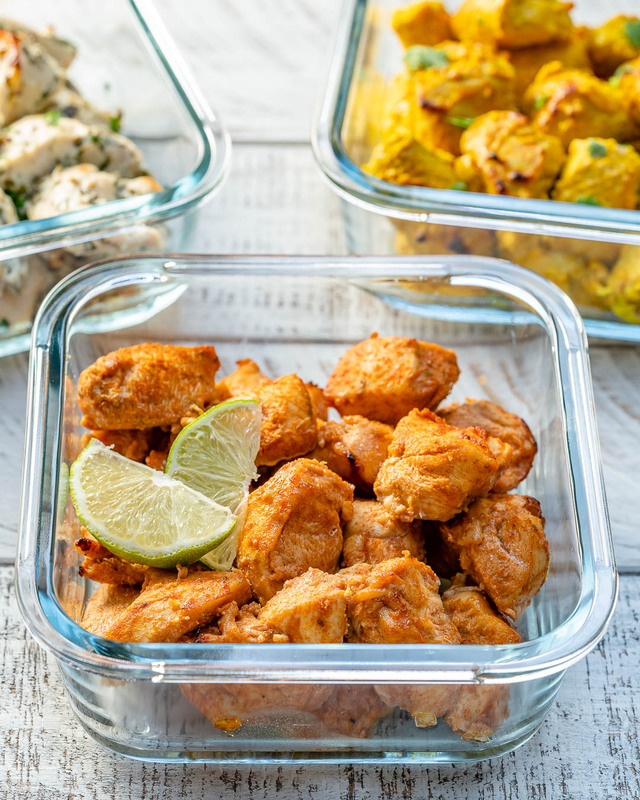 Allow meat to cool, then place in 4 different containers. 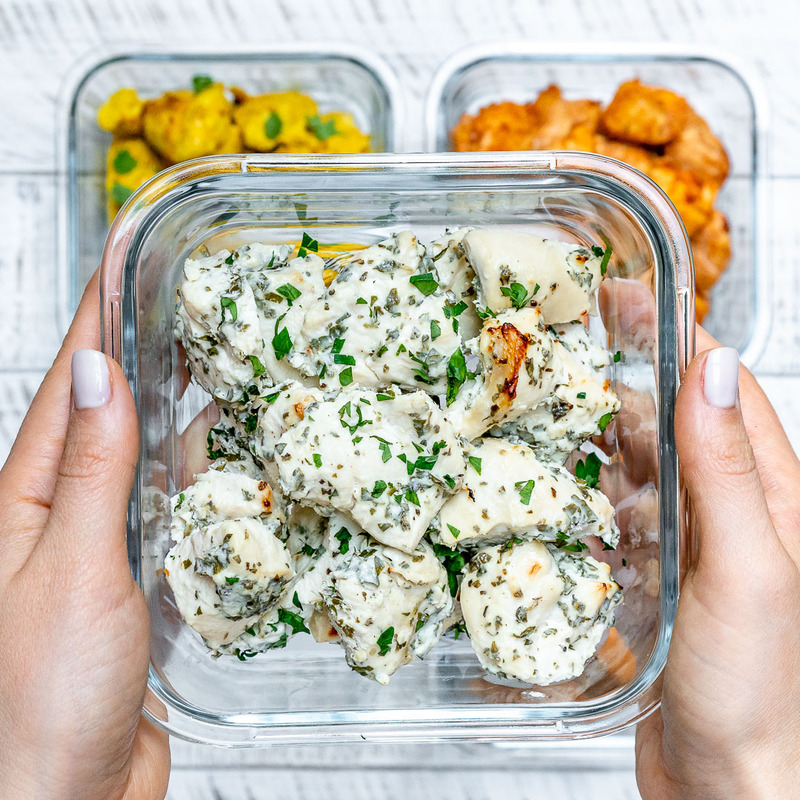 You can refrigerate for up to 5 days or freeze for up to 3 months. 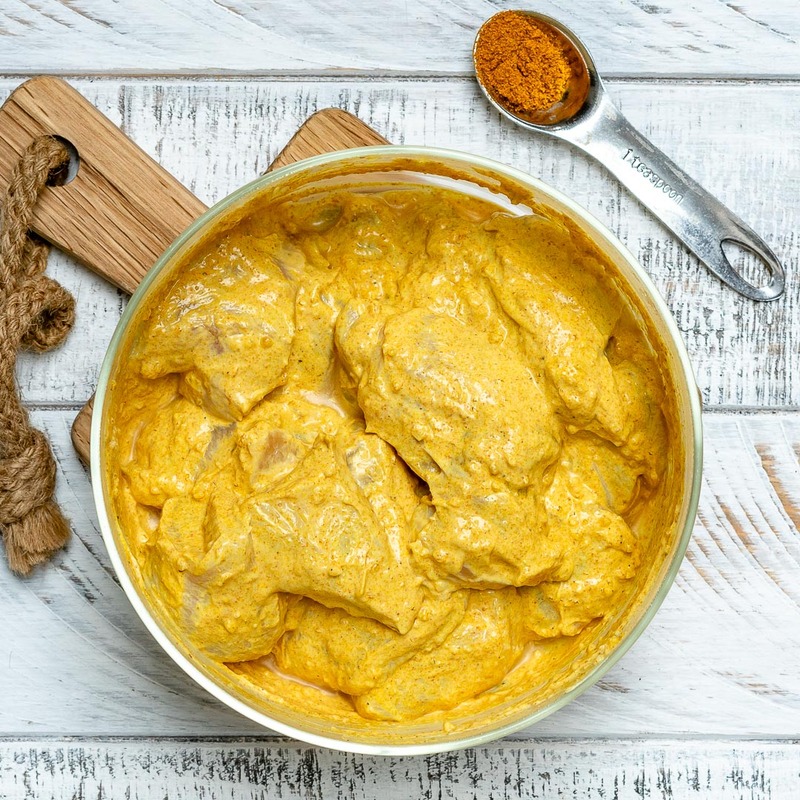 To prepare Curried Chicken: Add all the ingredients to a mixing bowl, or large Ziploc and gently toss to coat well. 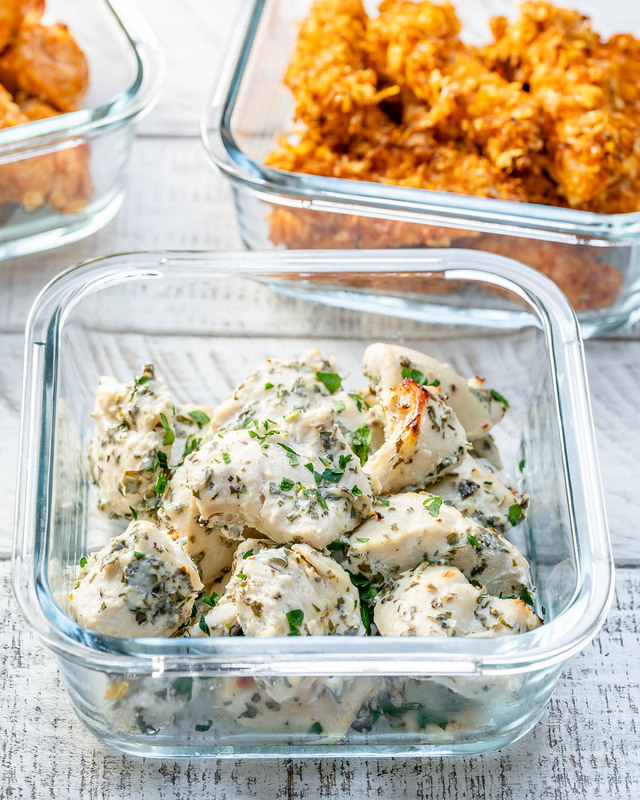 Cover and marinate in the refrigerator for at least 1 hour or overnight. 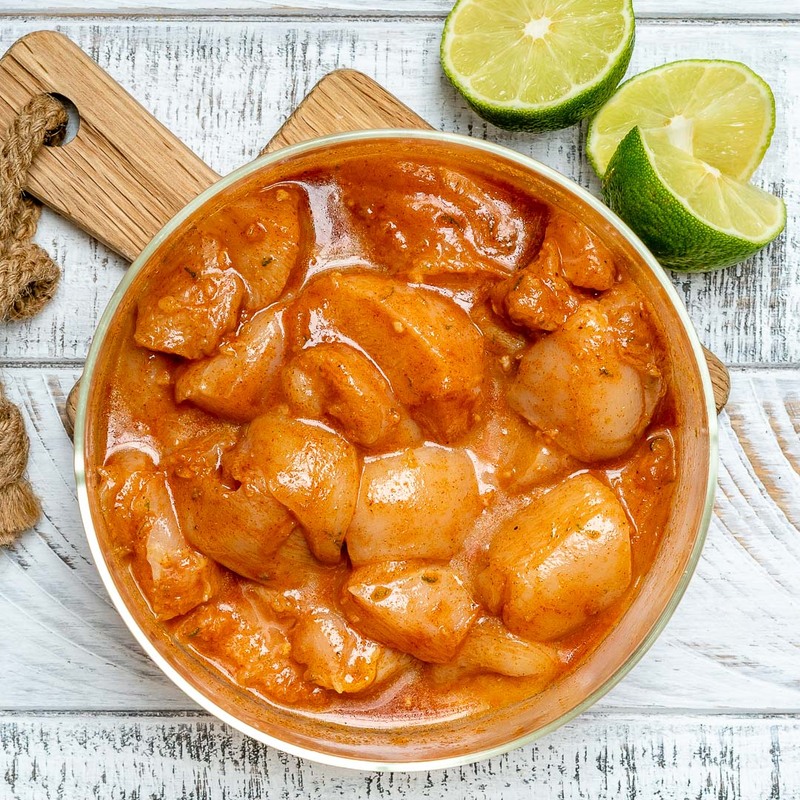 To prepare Chili-Lime Chicken: Add all the ingredients to a mixing bowl, or large Ziploc and gently toss to coat well. 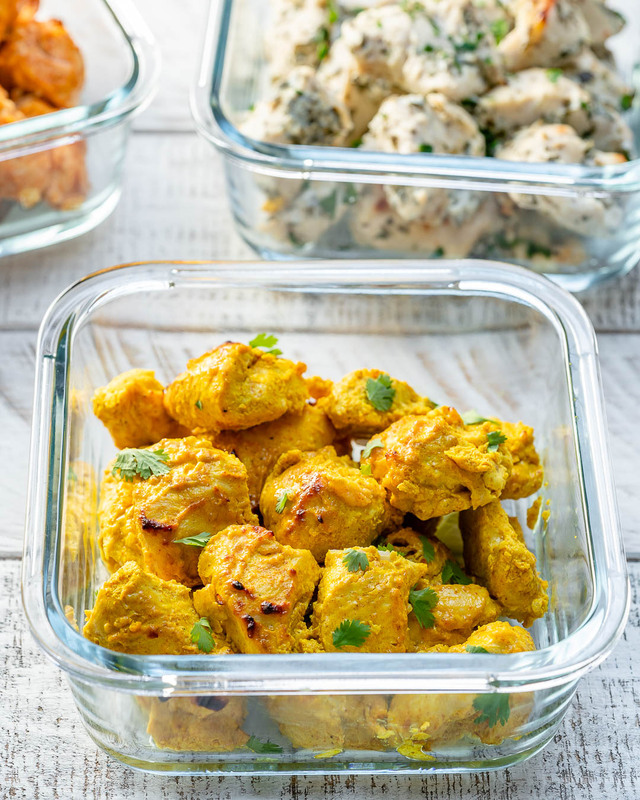 Cover and marinate in the refrigerator for at least 1 hour or overnight. Add all the ingredients to a mixing bowl, or large Ziploc and gently toss to coat well. 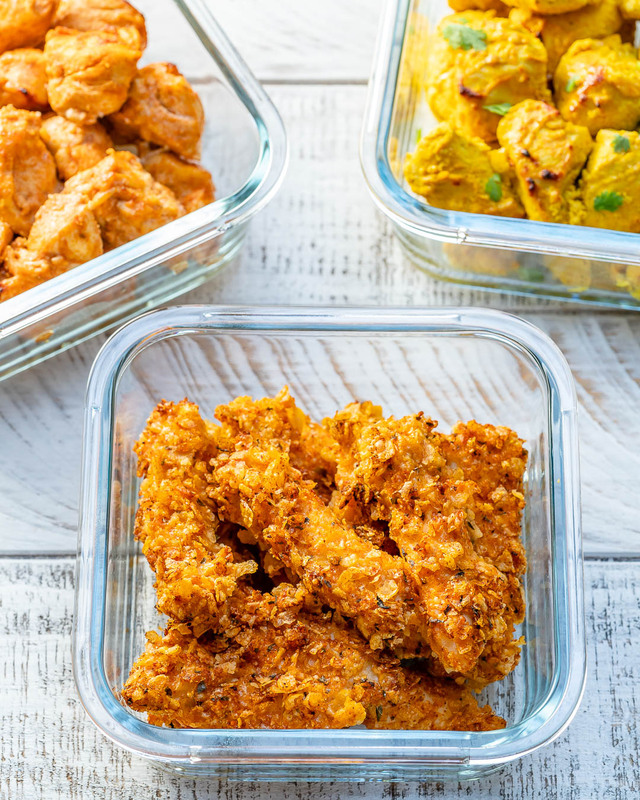 Cover and marinate in the refrigerator for at least 1 hour or overnight. 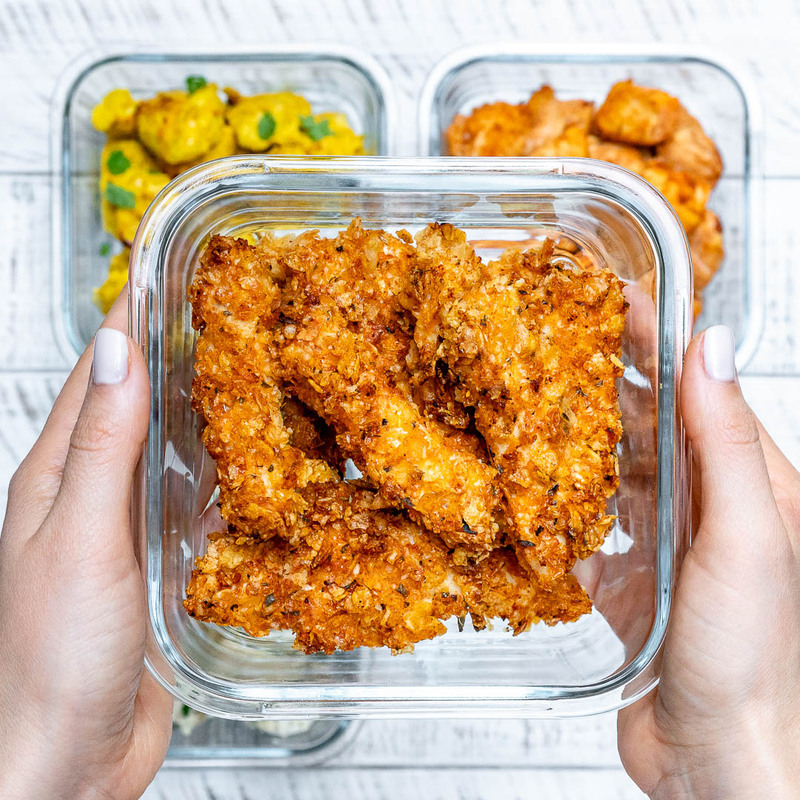 To prepare the Chicken Fingers: In a medium glass bowl, add egg, sea salt and pepper, and whisk until well-combined. 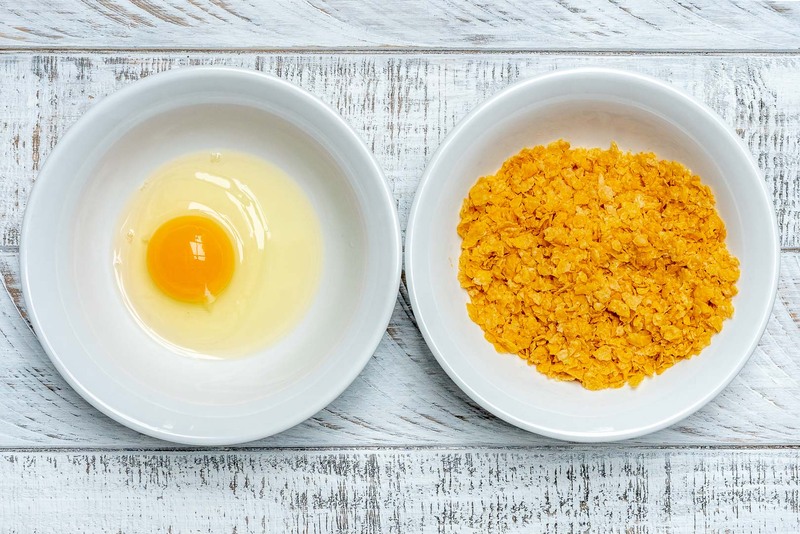 In another bowl, stir together crushed corn flakes, parmesan, paprika, oregano and garlic powder. 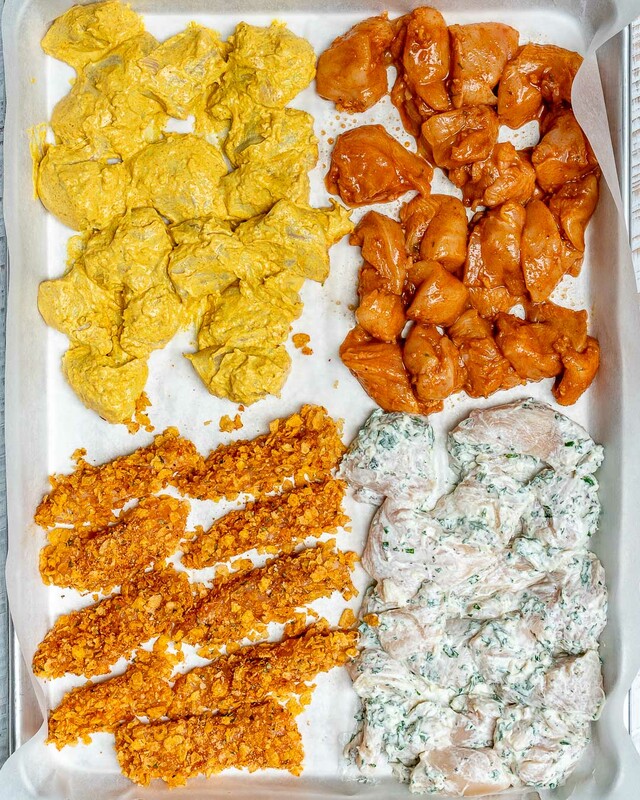 Coat each chicken piece first in the egg wash, then into the corn flakes mixture, making sure you get it well coated on all sides. 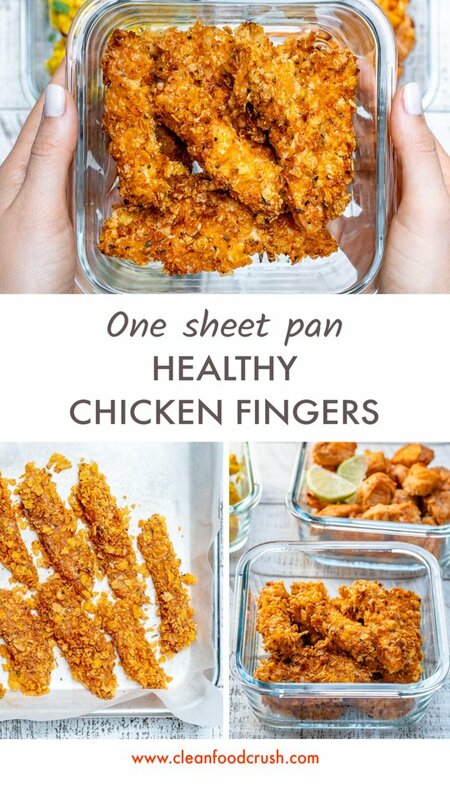 Shake off the excess and place onto one corner of the prepared baking sheet in a single layer. 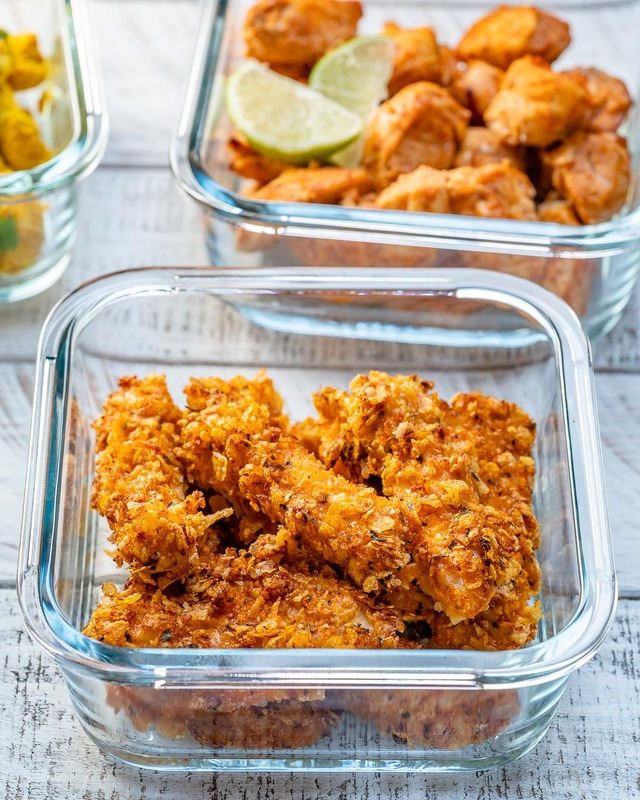 Lightly spray the tops of the corn flake coated chicken pieces with cooking oil spray.